This news shouldn't be shocking to anybody following even the vaguest contours of economic news for the last few years. As we knew, median household wealth popped in the bubble and collapsed in the bust, as housing prices fell by 30 to 40 percent in the worst-hit metros, in California, Nevada, and Florida. In 2007, barely half of families surveyed by the Federal Reserve reported savings. 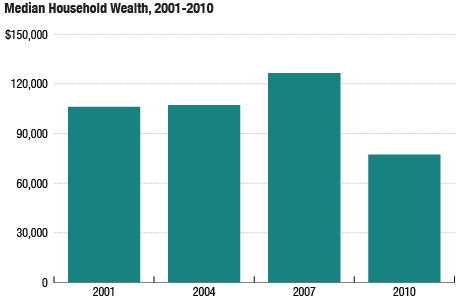 Just as the boom made families feel richer, the financial shock made families feel poorer. And so falling housing prices led to falling wealth, which led to falling spending, which led to falling private sector revenue, which led to massive job cuts, which dragged down housing prices even further, and around and around we go. This is simply tragic news, and I'm tempted to sign off after sharing the statistic, but I can't help but plug the reminder that this is why stimulus-supporters support stimulus. A nation that controls its currency and has low borrowing costs has not only an obligation but also an easy opportunity to step into the vicious cycle and erect a firewall -- either with (a) massive spending, (b) tax cuts, (c) lower interest rates, (d) higher inflation expectations, or (e) all of the above. If you pick "(f) none of the above" in this scenario, an F is what you'll get.